The Military Service Pay (MSP) for the military personnel was introduced recognising their unique service conditions and hardships. The seventh Pay Commission had fixed Rs. 5,200 as MSP per month for Junior Commissioned Officer (JCOs) and jawans while the MSP for officers between Lieutenant-rank and Brigadier-rank was pegged at Rs. 15,500. As per media sources that reported today, the government has rejected a long-standing demand of the armed forces for higher MSP for over 1.12 lakh military personnel including Junior Commissioned Officers of the Army. Following the development, the Army headquarters is reportedly “very anguished” over the decision by the Finance Ministry, and will seek its immediate review. The count of 1.12 lakh military personnel could include 87,646 JCOs and 25,434 personnel of equivalent rank from the Navy and the Indian Air Force who will be affected by the decision. The Army had taken up the issue strongly with the Defence Minister and all the three services along with the Defence Ministry were on the same page on the issue, the sources said. Yet the demand has been now outrightly rejected by the Defence Ministry. In a sharp contrast, an agency under the Ministry of Information and Broadcasting had said in reply to an Right to Information (RTI) query in May 2018, that the Narendra Modi government had spent ₹4,343 crore on publicity since it came to power in May 2014. The Bureau of Outreach Communication under the Ministry had confirmed that the government spent ₹4,343.26 crore on advertising its programmes across media platforms. 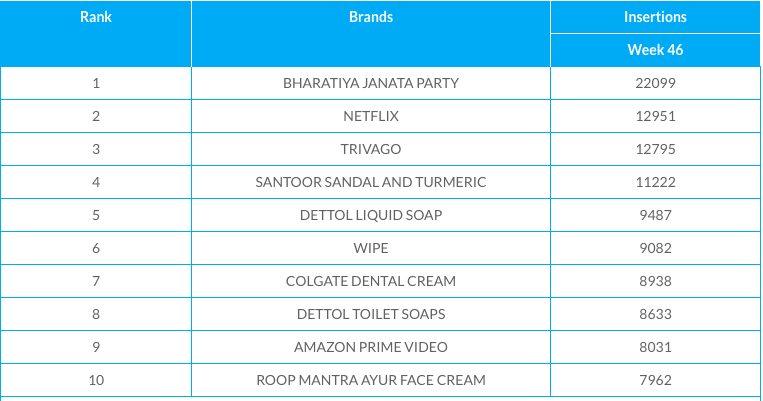 Also as per a weekly BAARC report in November 2018, BJP was the top advertising brand, followed by Netflix with 12,951 insertions, Trivago with 12,795, Santoor Sandal with 11,222 and Dettol Liquid Soap with 9,487 insertions. The ruling party was also on a spending spree before the recently concluded assembly election in Madhya Pradesh. Between August and November, BJP’s share of advertising in MP was 73% of the overall ad insertions across print, radio and television, while the Indian National Congress ad insertions stood at 27%, according to data from AdEx India, a division of TAM Media Research.